These miniature weavings are part of the South American "God's eye" tradition. Each metal frame or "loom" is individually handmade. The use of pure silk and metallic thread enhances the quality. 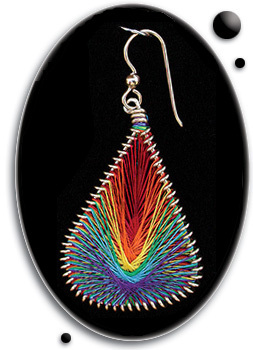 Each color is woven separately, this produces an iridescent sheen under all types of lighting. Mandala Jewels may be custom tailored to suit your color preferences. The earrings and pendants are lightweight, attractive, and sure to invite many compliments! Any color combination can be ordered in any size. To start your custom order begin by viewing the order page or browse our gallery. Copyright © MANDALA JEWELS - Austin, TX - All rights reserved - Please read the Terms/Conditions and Disclaimer.